Custom email addresses are included with all of the hosting packages we provide. If you currently use an email address which looks something like [email protected] for your business email communication, you need to switch to a more professional address. Why not use [email protected]? It is much easier to remember, looks professional, and promotes your website address as well. It is easier to remember and you get as much space as your company wants to give you. 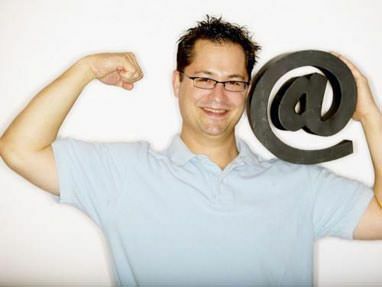 If you want a custom email address using your own domain name, this is the place. A custom email address using your own company's domain name provides an established confidence people need. When you provide your email address on your advertising media (such as brochures or business cards), people know you are serious about your brand. Not only does a custom email address project a more positive image to your customers than a free generic account, it can also serve as an incredibly powerful communication tool. People immediately know what company you work for and customers can contact you through your company email address to ask for information regarding your products, or for assistance, and you can quickly respond to assist them. Do you have a list of email addresses that you email the same information? Let us set you up with a mailing list. Type the message once and send to all of your recipients instantly. No need to copy and paste. You don't look very professional using an AOL, Hotmail, or Yahoo account. You should use an email address that promotes your purpose (especially if you have an existing website). We can set you up with a professional-looking email addresses that automatically forward your email to the email account you currently use! Silver Scope Design has very affordable email services to give you that professional image with the convenience you demand. Call us now and talk with a representative about how our email services can streamline the way you communicate with the world.